Today I want to talk to you again about the importance of spatial geometry since this is what tells us how our universe is mounted, therefore how it works and how we can exploit it. We all know that there are more than three dimensions, at least simply because of living. We have the three spatial dimensions and a temporal dimension. For us all linear and continuous. This is what our friend Einstein (with help) has gotten us into the brain and that many, out of ignorance, have misunderstood for their magufadas. And they have heard, but not understood that physics has been developed through what our senses have been able to interpret, giving it a mathematical structure that has helped us to explain and understand it. Giving rise to new questions and doubts that have made science advance. From there, we have seen that there are “things” that our senses are unable to see, both in the greatest and the smallest, from galaxies and clouds of cosmic gas that we are unable to see, to a simple atom, that no matter how much we look, we do not even see them. Einstein interpreted that the universe was composed of more than 3 dimensions. In fact, by its time it was a mathematical idea that swarmed around 1905 and that, like any good physicist, I simply interpret it in nature. Thus, Newton’s gravitation explained it thanks to a new dimension that we did not see but that was the one that attracted to objects thanks to the model as a vector field. In fact, it was so round, that there was an extra dimension that attracts the bodies that Maxwell’s disciples (who studied the electromagnetic force) applied the same principle (of vector field model) to that force to finish indicating that there is another dimension that gives body to electromagnetism. 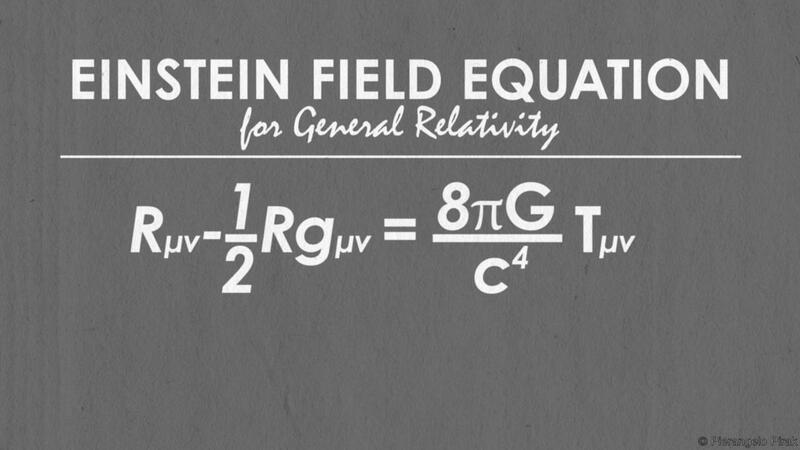 In other words, it gave vectorial field body to electromagnetism. Well, in fact it was the reverse of Maxwell’s works and the relationship between charges, speed of light, field theory … he and Hertz provided the basis for Einstein postulating his “extra dimension” that explained equal gravity than electromagnetism. Maxwell was before Einstein and if it was Klein and Kaluza they indicated that it was one more dimension. The problem with all this is interpretation. We, the humans, are very short-lived sensory speaking and we are unable to leave our patterns. That is why thinking about a world of more than 3 dimensions is exhausting and projecting more than three dimensions on three (algebraically speaking) gives us results that we do not understand. That is, painting (for example) more than three dimensions in three makes us crazy (example painting a hypercube). That is why we have turned to ways of interpreting a greater number of dimensions under our own in graphs and that are understandable so that they help us to have new questions to keep moving forward. An example is the Minkowski space. The Minkowski space is an interpretation, first visual and then mathematical of a space of four four dimensions. In fact it is a simplification of a space of higher dimensions in a space of dimensions less than consists of eliminating them. In it, we will paint a single geometric axis (or two at most) and eliminate the third painting time in the. 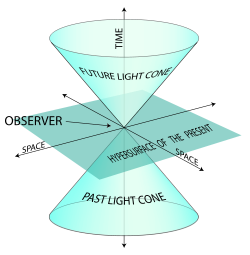 In this way we will have the cones of “existence” since, as we know, time is continuous and constant and no one can travel faster than light. Therefore, all that is within the cone is “achievable, visible and accessible” while what is outside, can not be seen, nor reach, nor know. It is simple. This brings us to mathematics. Mathematically it is a representation of space relativistic time (that’s why the cone where you arrive and where you do not arrive) where, we know, time and space is modified depending on who the observer. For example. 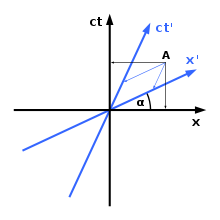 If someone (let’s call it A) goes at a constant velocity and traverses a space x at a time t, for another observer (B) that can be still or at a constant speed (that is why it is relativistic, because it is not distinguishable, constant if your system is at rest or not), observer A will have traveled x ‘at a tempo t’ at a speed v. Simple. Now, if, as we see in the previous graph where the coordinates t, x, y were observed, we see that x and y are spatial and t is time, we will see that although the graph is understandable, we are “measuring” or comparing time with space, units … do not fit. But what if we make the axis of t multiply by c and let ct ?. 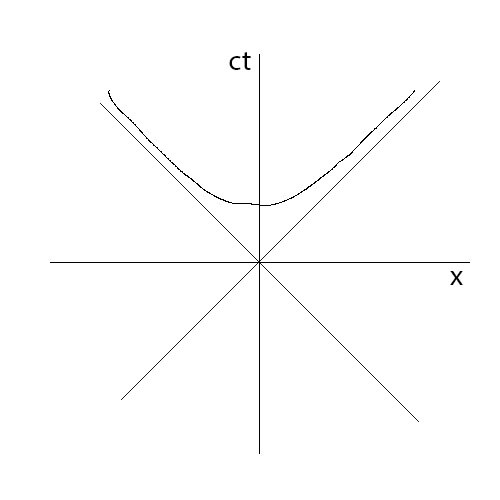 If x and y are measured in meters, ct will be meters divided by seconds multiplied by (example) seconds, giving rise to meters. We are already measuring and comparing the same. Cool!. Now, since the only thing that would vary the scale, we would have the same cone and we could put there what advances one of the two observers (for example A). What would give us (since we have said that only advances along the X axis, to simplify) that we can find by Pitaagoras the hypotenuse formed (I have taken the image that is on this paragraph of the internet, but you understand what I am explaining in her perfectly). And I use less, since it does not matter that we consider the negative space. But if we do it from the other observer, we can substitute the previously related values of time and space. It is a mathematical process that I will simplify by being boring. That is, it is the same and it is an invariant. What curious!. Then it is a way of representing space time, which, if we paint it on the previous graph, is a hyperbola pointing downwards (you do not laugh at my bad drawing, so you will understand because I take the images of people who do it better than I do) and is the Minkowski space. Being a space of zero curvature, we have concluded that we can draw a unit of universal time measurement for any inertial system so that everyone agrees with that unit and measure of time go at the speed that they go. Come, from the geometry of something we do not see we have brought something that serves the world that we are able to observe with our senses.